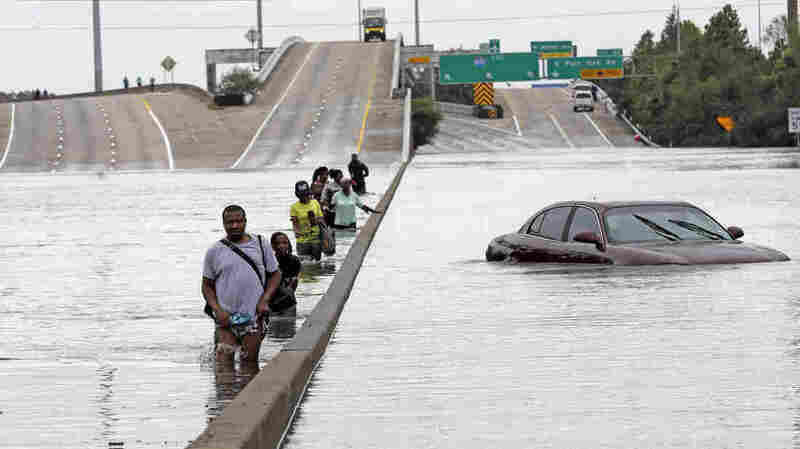 What We're Hearing In Texas: Residents Discuss Harvey's Floods : The Two-Way "I'm overwhelmed of all that's going on and not knowing if my home is going to be there; if my dad is OK — it's just ... I don't know what to say." Residents of southeast Texas are taking stock and trying to absorb record flooding brought by Hurricane Harvey. Here, evacuees wade down a flooded section of Interstate 610 in Houston as floodwaters continued to rise Sunday. The scale of the catastrophe hitting southeast Texas and parts of Louisiana has residents struggling to protect their lives and property, as up to 50 inches of rain is forecast to hit some areas in the wake of Hurricane Harvey this week. For a sign of the conditions in Houston and nearby areas, consider this: The U.S. Coast Guard says it's "conducting urban search and rescue in the city of Houston." "I'm overwhelmed of all that's going on and not knowing if my home is going to be there; if my dad is OK — it's just ... I don't know what to say." — Shirelle Franklin, who fled Victoria, a town between Houston and Corpus Christi. In Rockport, where Harvey made landfall as a Category 4 hurricane, many residents stayed, despite a mandatory evacuation order. "When locals found the doors of a local elementary school unlocked, they set up their own shelter," NPR's Rachel Martin reports. Rachel spoke to Mashon Hunt, 17, who grew up in Rockport and went to the shelter with her 8-month-old daughter and her mother. Hunt helped the makeshift shelter provide the care for an estimated 250 people, before leaving for another shelter in Austin. "I'm very tired," Hunt told Rachel. She says that while the school had cots, there wasn't much food at first, so they instituted a rationing system. And some of the people who came in also needed oxygen. "It was kind of a tight squeeze until we could actually do anything," Hunt said. She says she and her friends "came together as one and we started helping people come in, and make sure they had what they needed, that they were calm. And it's crazy, but it worked." Hunt doesn't know how her home fared. As of Monday, she said: "The conditions here are really good right now. Me and my daughter and my mother are good. We have a place to stay and sleep. Having food and such great staff here — you know, it's a blessing just to come here and know that we were safe and taken care of." "The first wave we were fine, we only had this little piece of roof off. But after the eye, the second wave — it tore it up a lot more. We have a back wall completely missing." John reports, "Their shrimp boat floated away; a 7-foot storm tide swamped their mullet and croaker tanks and everything else in this wooden shack perched on the water's edge." Salazar says: "We're grateful that we've got something to fix up. Other people doesn't have nothing to fix. I mean, they've gotta go from the bottom up. We actually have a floor, we got a few walls. We got a boat that's floating up. I mean, we can fix these." Nassau Bay: Southeast of downtown Houston, Geraldine Mason, 70, heeded evacuation orders and moved to a hotel. Mason lives near a marina, in an area that's also home to NASA's Johnson Space Center. NPR's Jeff Brady reports, "On Sunday she went back and couldn't even reach her house there was so much water in the neighborhood. But she said she's happy she left before the storm." "Because we would have no way of getting out, in either direction," Mason said with a laugh. "Because as you can see we are right across the street from the bay, so — you know, our faith will just get us through it. It is what it is." The Coast Guard says it's carrying out rescue and relief work using 18 helicopters and nine flood punt teams. It also warns residents who are desperate to get away from life-threatening water: "Don't go into your attic. Rescuers from air can't see you. Get to high ground; mark your roof."